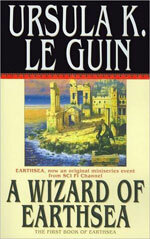 A Wizard of Earthsea by Ursula K. Le Guin is a beloved fantasy classic that subverts expectations. I wasn’t impressed. It’s the coming of age story of a wizard, but unlike Harry Potter or Lord of the Rings, there are no wars and the main enemy is primarily internal. It was an intentional choice by Le Guin to create something different and portray a world that wasn’t defined by endless war and violence. It also has the distinction of being a fantasy novel published in 1968 where nearly all the characters are people of color. The only white characters are villains and savages, a telling reversal. Unfortunately the publisher refused to reflect that in the cover art. While all that is fascinating, I didn’t think the story was. I’m not a big fan of fantasy, which is one big strike, and then the story felt distant and slow. Part of it was her style, which felt older than the 1960s—more like ancient legend. Then there’s the fantasy trope—”I traveled to the [bizarre description] isle of [weird name], and found the [more bizarre description] people, know as [another weird name]. But I think the biggest factor was the slow plodding pace of the story and feeling like we weren’t going anywhere. This is probably sacrilege to all the Earthsea fans, but there it is. The book has more than 100,000 ratings on Goodreads, and still has a very positive 3.96 rating (out of 5), so clearly lots of folks would disagree with me. Previous PostHalf Way Home: Colonies, Lord of the Flies & AINext PostDo I Teach My Son That Police Are Heroes or How Not to Get Shot?